Wickless & Polished! : Helmer Time! 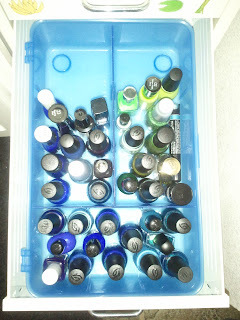 I guess its time to do a photo shoot of my current stash. Ive been adding to my polish collection for under a year now so its not too bad. But I am running out of room. 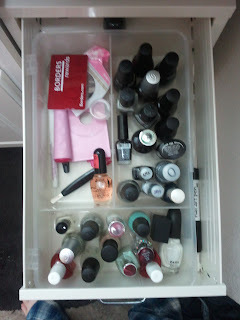 As from another blog and a friend, I got the idea to use an Ikea Helmer to store my polishes. I also added some small boxes from Ikea to keep colors seperate. I do seperate by color and not brand. My first drawer has my Konad plates, blacks, slivers, greys, whites, sparklies and top and base coats. Second drawer is like a horse shoe, lol. From left is my purples, bottom is pinks and right is reds/orange/yellows. As you can see, I even have some stashed on the side of the organizer. Third drawer does a horse shoe again. Left is blues, bottom is blues/teals. 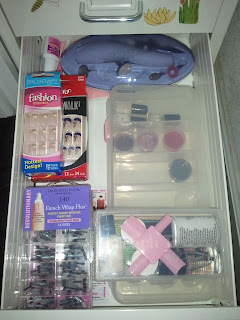 Fourth drawer is mt fake nails, silk wraps, French Tip Dip Kit and extra pots for FTD colors. Next drawer is just polish removers and cotton balls. 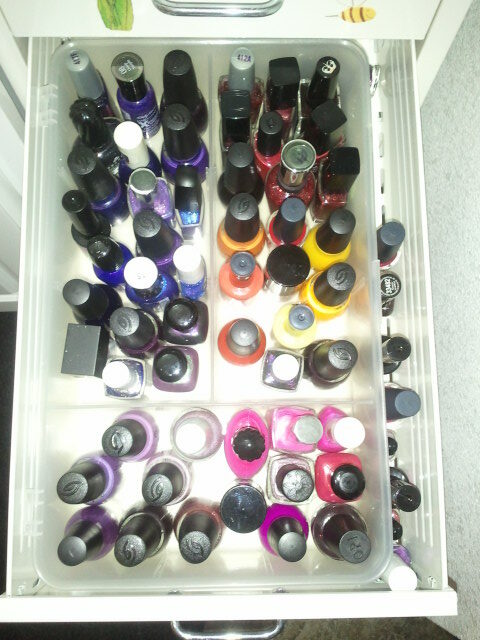 Last drawer is just my straightening iron and hair dryer, not polish related at all. I havent counted how many I have because Im worried Ill want to make it a certain number and continue to add. Thanks! I understand how you feel. Ive always liked darker colors on my nails because my hands just arent that feminine. Yet, Ive gear toward a lot of lighter girly colors! Very odd. How many purples do I really need!